On March 1st, 2012 we will have a new Subject Content Specialist (SCS) in Robotic and Automation concentration. Pak Satrio, after all this time being an associate faculty member, has decided to be a faculty member as Subject Content Specialist. It is a pleasure for us to have him here and presumably we can learn a lot from his experience. 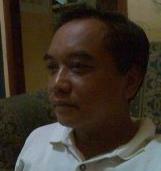 Pak Satrio got his Master Degree from University of Tsukuba Japan majoring science engineering. In his career as lecturer, he has many experience in attending trainings, workshops and seminars. He also have many experiences in producing many scientific paper and research. Rinda Hedwig Get A Grant...!